Bring your garden to life this spring with an astounding show of pearlescent, pure-white blooms that's guaranteed to get your neighbours talking! A deciduous shrub, Exochorda serratifolia 'Snow White' is grown for its large, pure white flowers, which burst from rounded buds in spring, smothering the bush. The buds resemble pearls, giving rise to its more common name of the Pearl Bush, and are unaffected by spring frosts so the pearlescent blooms that follow make a truly remarkable spectacle in the spring. Exochorda is relatively compact, only reaching around 4m x 3m in 10 years, so is ideal for small gardens, and can easily be pruned to further reduce its size. Easy to grow and care for, once established, plants are drought tolerant, making them ideal for modern gardens and for gardeners concerned with climate change. Supplied as an established plant, 40-50cm tall, including 3L pot. A deciduous shrub, Exochorda serratifolia 'Snow White' is grown for its large, pure white flowers, which burst from rounded buds in spring, smothering the bush. The buds resemble pearls, giving rise to its more common name of the Pearl Bush. A native of Korea, 'Snow White' is unaffected by spring frosts so keeps its pearlescent blooms through early spring making a truly remarkable spectacle in the spring. Happy in sun or dappled shade in any well-drained soil, Exochorda is relatively compact, only reaching around 4m x 3m in 10 years, so is ideal for small gardens, and can easily be pruned to further reduce its size. Easy to grow and maintain, once established plants are drought tolerant, making them ideal for modern gardens and for gardeners concerned with climate change. Best grow in full sun, the pearlbush will however also grow in partial shade preferring a well-drained soil - although it's quite tolerant of most soils except waterlogged areas. 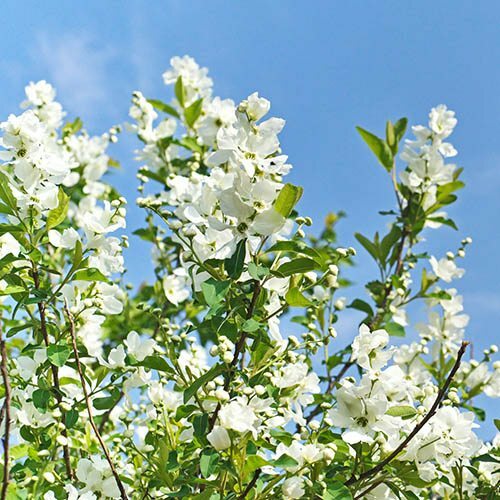 Exochorda trees do not require regular pruning, just a quick once over to remove any dead, diseased or damaged branches in the winter.